Puh-leeze. If we want to look at prim and proper houses, we’ll go back to the snooty suburb where we grew up. We’re in the mood for Manhattan Beach. We want to see big and bold. And there’s plenty of that to be found in the Atlantic Ocean-side neighborhood, in the form of homes that have been enlarged in recent years and newly constructed houses that replaced smaller tear-downs. Some of our favorites look like a cross between Miami Moderne buildings and Black Sea resort villas. There are also many houses with more traditional designs, and mucho charm. The contrasts between these old-school homes and newer residences are interesting to look at. * One of our favorite Manhattan Beach houses is located on a Shore Boulevard corner. 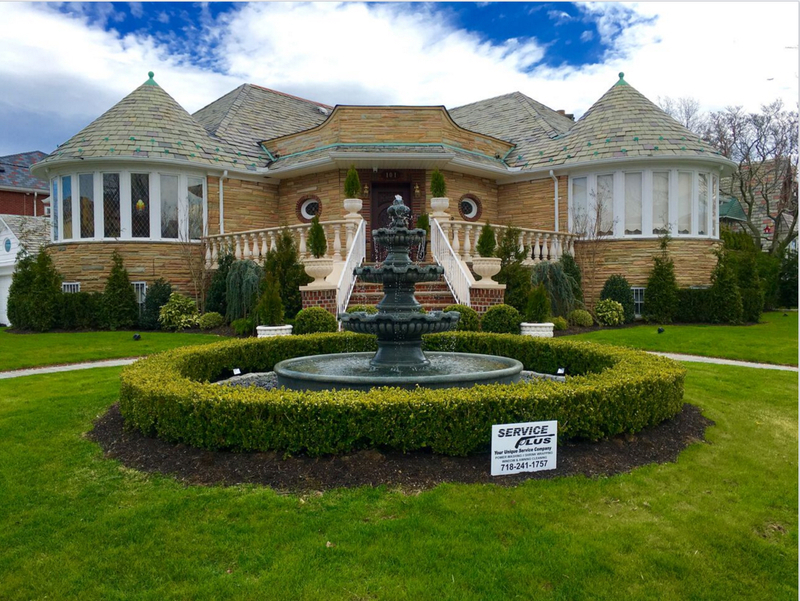 It’s so big that it caught our eye when we stood on Emmons Avenue on the other side of Sheepshead Bay’s waters. The house, whose address is 2 Dover St., is ringed on all sides by columns and has outdoor statuary, which calls to mind an ancient Greek temple. The house was designed about a decade ago by architect Nataliya Donskoy, city Buildings Department records indicate. In 2007, Yakub Yakubov and Zoya Yakubov sold the property for $5.76 million to Desmond Realty Inc., city Finance Department records indicate. In October 2014, Desmond Realty sold the house for $7.75 million, with Peter Goldberger signing the deed for the seller, the records show. The buyer was 340 Shore Boulevard LLC. The name of the person who signed the deed on the purchaser’s behalf is illegible. The buyer did not take out a mortgage. So there is no public record identifying the person or people who currently own the house. According to the deed, the purchasing LLC’s address is that of law firm Spektor & Tsirkin, which specializes in intellectual property matters and immigration services. * Another of our favorite houses in the neighborhood is 296 West End Ave., a gated Miami Beach-style stucco manse with lion sculptures flanking the front windows and Atlantic Ocean frontage. Appealing amenities such as an infinity pool can’t be seen from the street because of fencing around the property. But we’ve read about the pool because there were extensive write-ups about the property when owner Gary Vinbaytel put the house up for sale on two different occasions. The asking price was $9.75 million in summer 2012. He took the house off the market after it was damaged by Superstorm Sandy. In 2014, after the installation of a waterfront storm barrier by the U.S. Army Corps of Engineers, the West End Avenue compound was offered for sale for an asking price of $8 million. Vinbaytel hasn’t sold the house, though. In July 2015, he transferred ownership of his home to the Vinbaytel Trust, with him as trustee, Finance Department records show. * One of the prettiest homes in the neighborhood is a white Spanish hacienda-style house with green trim at 144 Exeter St. It has a fine lawn and lovely landscaping — which made it hard to take a photograph worth publishing. * Other stucco haciendas that charm our eye are at 138 Hastings St. and 166 Beaumont St.
* How about some stately brick mansions? The one at 802 Shore Blvd. on the corner of Falmouth Street has columns flanking the front door. In the back of the house, there’s a turret with a roof shaped like a witch’s hat. * Another classic brick mansion with a turret is at 519 Hampton Ave. on the corner of Exeter Street. * There’s a pretty green barrel-tiled roof on the red-brick house at 273 Beaumont St., which has excellent landscaping and a herringbone-patterned brick walkway. * There are sweet Tudor houses in various spots, including 250 Amherst St. and 4197 Ocean Ave.
* Old-fashioned frame houses such as 113 Norfolk St. and 115 Dover St. have great charm.